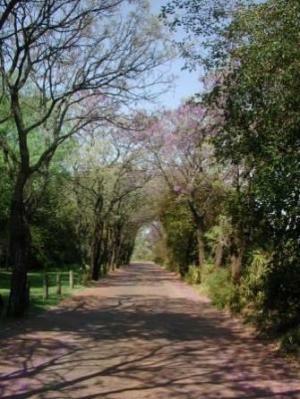 The Pretoria National Botanical Garden was established in June 1946 when the University of Pretoria granted approval to the Department of Agriculture for the development of a botanical garden on a piece of land that was previously part of the University’s Experimental Farm. The main reason for the transfer of land from the University was that the land had been found to be unsuitable for agricultural experimental purposes, owing partly to its isolation and also to the presence of an abundance of poison leaf (Dichapetalum cymosum), a plant which is poisonous to livestock. Private properties along the northern part of the ridge were acquired by the Department of Agriculture. The Garden was officially opened on 23 October 1958. This photograph was taken at the opening of the Garden in 1958. It is quite amazing to see how many trees and plants have been established in the Garden since then. 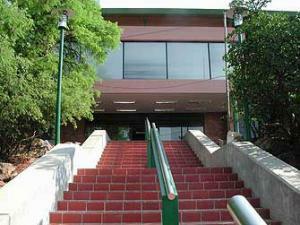 The National Herbarium was inaugurated in 1973. 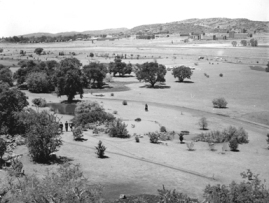 The Garden was initially known as the Pretoria National Botanic Garden and could only be visited by special arrangement because it was primarily a research facility under the management of the Botanical Research Institute (BRI), which traces its origins back to 1903. The Institute amalgamated with the National Botanical Gardens of South Africa to form the National Botanical Institute in 1989, which in turn became the South African National Biodiversity Institute (SANBI) in 2004. The Garden was opened to the public on a daily basis in 1984. The planting of Bolusanthus speciosus trees by Mr Jan Evens in 1946 was one of the first plantings in the Garden. 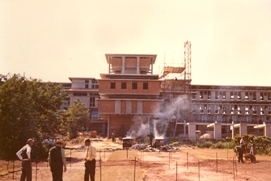 A small thatched stone building adjacent to the waterfall, which was previously used as the Botanical Tea Garden, was built in the late 1950s and initially served as the first office of the botanical garden. 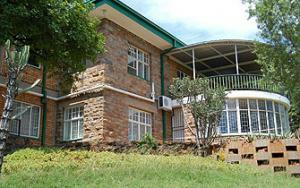 Aloe Lodge, previously called Velcich House, is situated on the northern side of the ridge running through the Pretoria National Botanical Garden. It was built in 1941 and was owned by Mr Antonio Velcich, who started the firm City Engineering in Mitchell Street, Pretoria. The building is now used as office space. Major infrastructure development has taken place since the 1990s and includes the construction of the Visitors’ Centre. This centre comprises a ticket and information office. Other developments include the Environmental Education Centre, Medicinal Garden, concert stage, lapa and the Biodiversity Building, which houses the Head Office of the South African National Biodiversity Institute. The paving of the main walkways and the area around the wetland and the dry stream project have been completed. Pretoria Portland Cement sponsored the construction of the artificial waterfall in 1993. 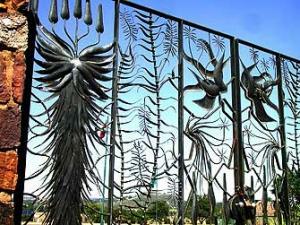 The old entrance gate depicting species of Aloe, named the Reynolds Gate in honour of Dr Gilbert Reynolds, who was an amateur botanist and an authority on Aloe plants, is permanently closed now. The new entrance is situated at the new Visitors’ Centre adjacent to this spectacular work of art. This beautiful wrought-iron artefact was designed and made by Hans Brugger. The other gate, also made by Mr Brugger, is the entrance to the Herbarium building and the new Biodiversity building on the rocky ridge of the garden.